My fingers have been itching to type out this recipe & post it for a while now. I just can’t seem to resist baking and although I made these muffins in about 10-12 days after I had tried the Zucchini & Choco Chip Loaf Cake, it took a while to actually get the post together. It was my first experience baking with Zucchini and I had more than enough for the cake & so I put away some in the deep freezer to make something else with it. Since I have always wanted to bake with my favourite chocolate & hazelnut spread – Nutella, I thought it was the perfect occasion to try out some muffins with dollops of Nutella spread on top. Babble.com which has some great recipes for every occasion & every need published one such article on healthy snacks for kids & I found this recipe from one of the links showcased in that article. Incidentally Ruchik Randhap has also been nominated as Babble’s Top Mom Food Blogger nominees for 2011, so please do vote for me by clicking here and then scrolling down to #43 (which is my current ranking) – I have been listed as ‘ruchikrandhap’ – please cast your vote by clicking on the thumbs up symbol. Thanks in advance! Getting our little ones to eat some vegetables seems to be the top priority for us mothers. I am glad that my son accepted these muffin very well both the times – yes, the first time they were loved so much that I made them again for some friends. It was well received the second time around too as our friends as just as health conscious as I am. The use of olive oil instead of butter made these muffins very light & delicately tasty. I also replaced part of the all purpose flour (maida) with whole wheat flour (atta) just to make the health scales tip a little in my favour. The above picture is from the first batch of muffins where I was extra generous with Nutella. You see, my son has this habit of asking me to buy random things whenever we are shopping & Nutella was one such obsession. Since I love it too, I bought a bottle which went untouched after 2 spoonfuls slathered on bread. We have a saying in Konkani called ‘Ghare Kodu’ which roughly translates to ‘grapes are sour’ although the metaphor refers to a case of eating too much of something & then never ever wanting to see it again. That’s exactly what happened to sonny boy who ate too much Nutella & gave up one fine day. 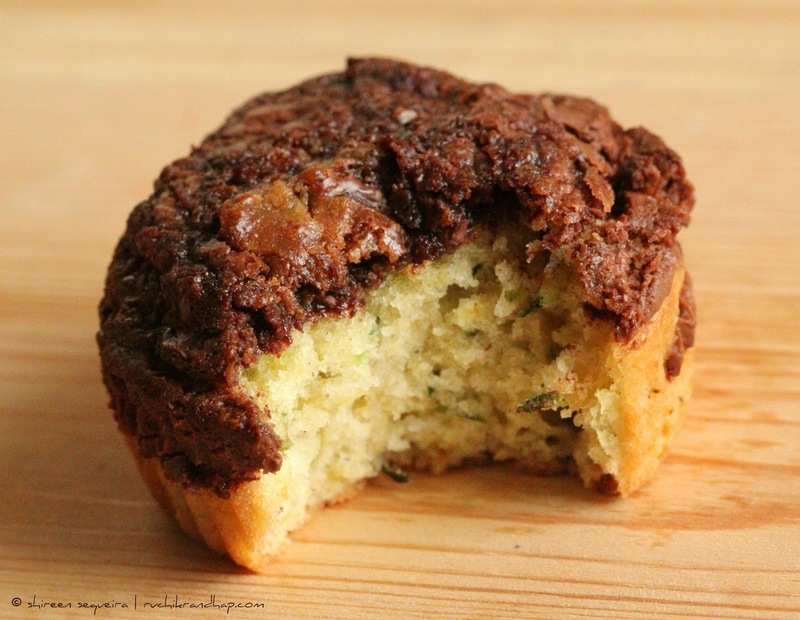 Make these muffins with or without the Zucchini. Skip the Zucchini & add raisins or grated carrots or chocolate chips. You still have a win-win situation on your hands as the Nutella is enough to tickle anyone’s palate. 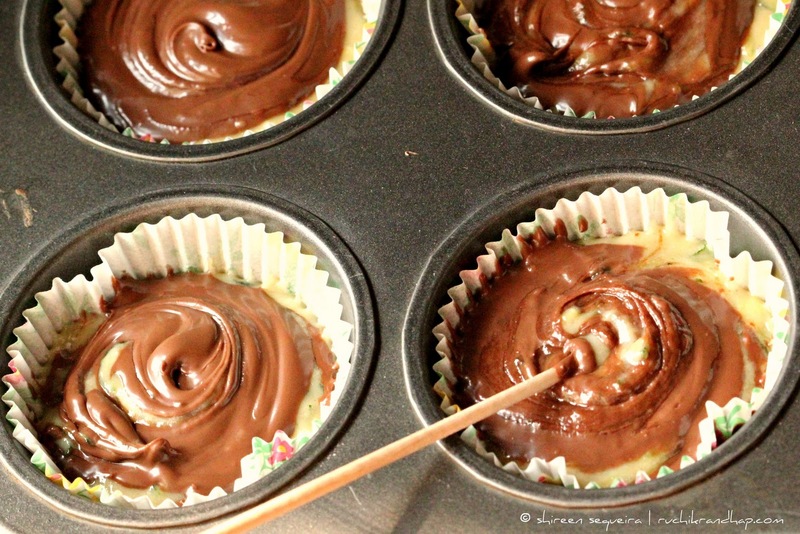 You can add melted chocolate or chocolate ganache as a topping if you do not have Nutella. Try these as the festive season is just round the corner and I am sure these babies will be well received by your guests as well! 1. Preheat oven to 175 C. Line a 12 cup muffin tin with paper liners. 3. In a large bowl mix the sugar & oil and beat well until the mixture looks pale. Add the eggs one at a time and beat well. Add in the sifted dry ingredients in parts and mixing well till all the flour has incorporated into the egg, oil & sugar mixture. Mix in the grated zucchini & lime/lemon zest. 4. Use a tablespoon to scoop out the batter into the paper liners. Each liner should be 2/3rd full. 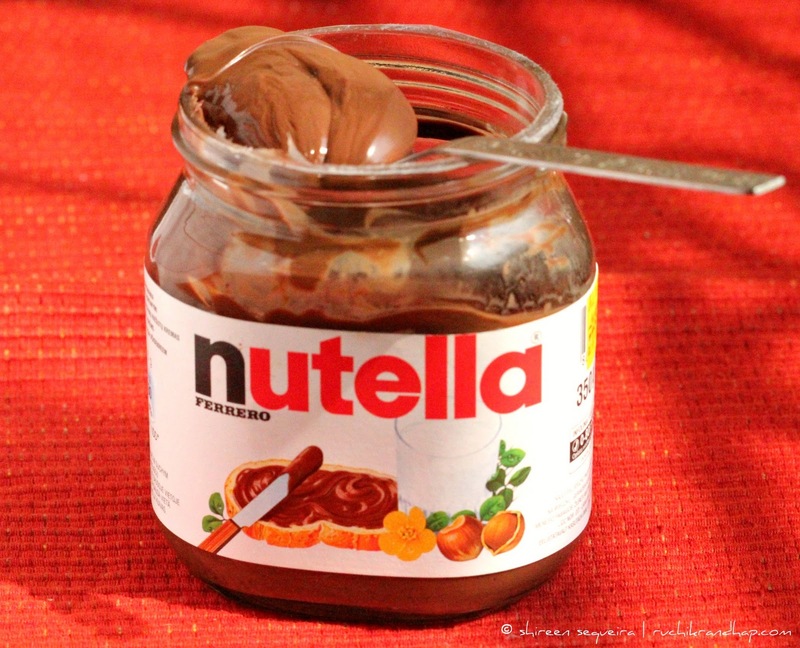 Use a teaspoon and scoop out approx 1/2 tsp Nutella each into each of the liners. Add more if you wish. 6. Bake for 15-20 minutes or until the skewer inserted in the centre comes out clean. The original recipe calls for butter which will result in richer muffins. The first time I tried these muffins I made a smaller batch with 1 cup flour & 1 medium size egg. For 1-1/2 cups flour you may need 2 medium size eggs. If the batter feels a bit runny after using 2 eggs, it is ok, the muffins will turn out fine. 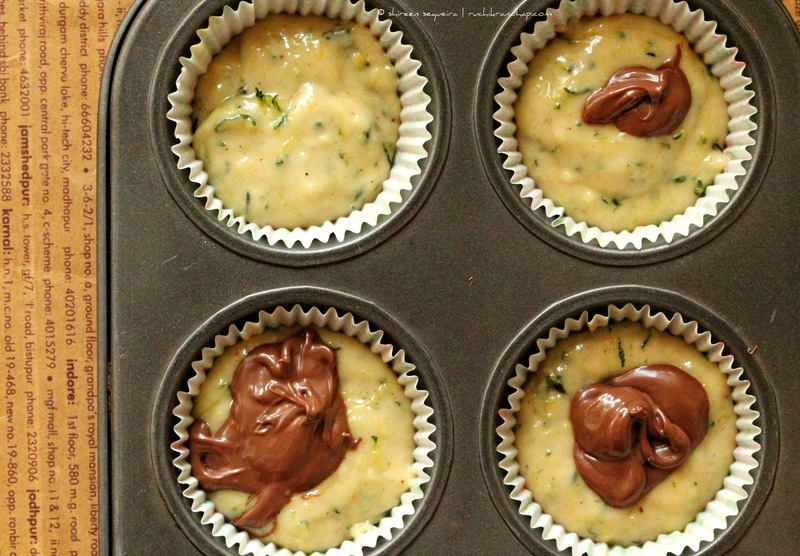 can i make these muffins without Zucchini? thats really awesome. love this recipe and these gorgeous cuppies. 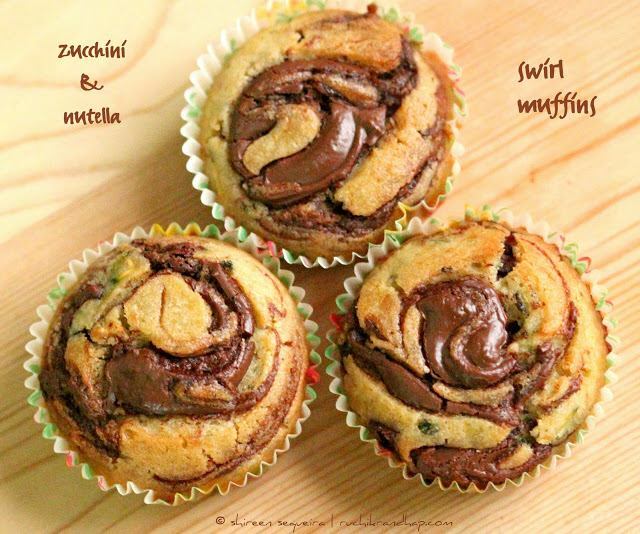 Omg, seriously am drooling over that incredible swirl muffins..fabulous. A perfect treat to the tummy and the eyes. 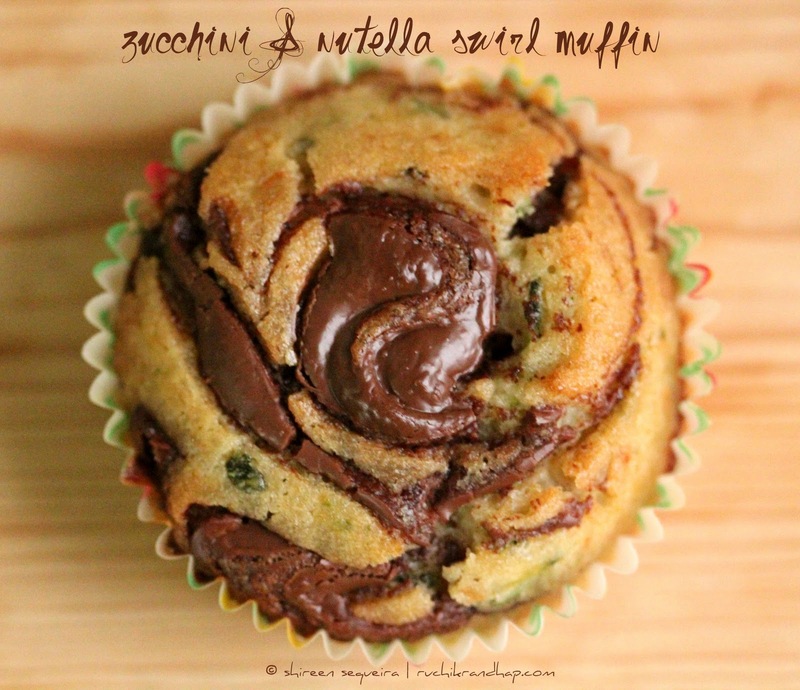 Awesome muffins,with goooey nutella, a sure try in my kitchen soon. Oh looks divine Shireen. I have some half jar nutella sitting on my countertop too.. Must try something. This looks really good..Mouthwatering dear..Thanks for the recipe .will try soon..
Hi Shireen, you have a lovely blog..keep up the good work. I have tried a few Mangy recipes from your blog and they all turned out super. Especially kori ghassi! Thank you for sharing these recipes. Would you have the Mangalore masala pitto recipe? It is added in everything – kolmbo, sprouts ambat etc…I think the ingredients are chana dal, urad dal, coriander seeds etc. Would loooooove it if you could post a recipe? Many thanks and keep up the good work! Glad to have found your blog, great collection here. 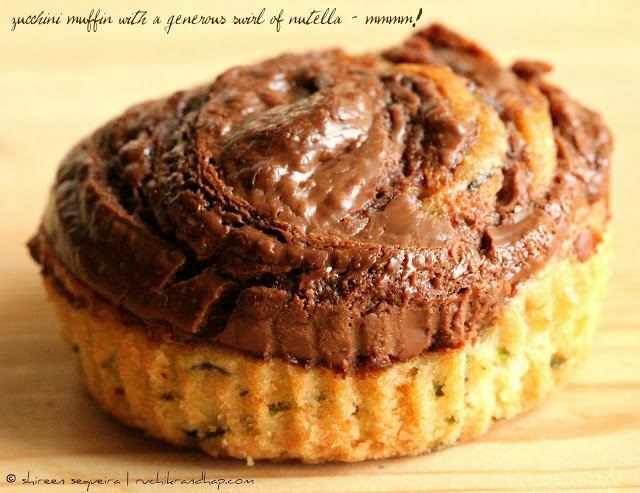 The muffins look incredible, nutella makes it even better.